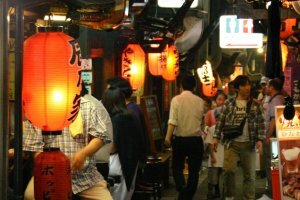 A trip down Memory Lane, Shinjuku Omoide Yokocho. 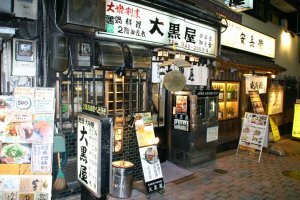 Yoji used to come here after the war, in the early 1950s. “I was a young man then,” he says. 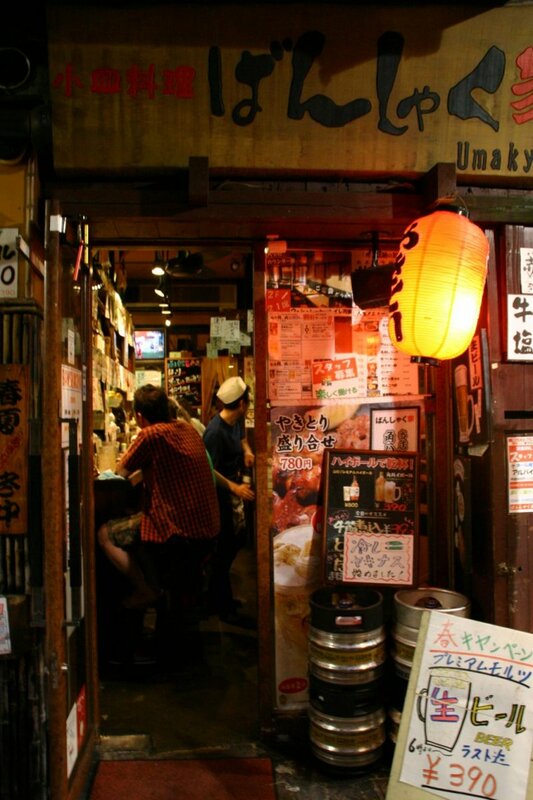 “I’d just started my first job.” Omoide Yokocho, which means Memory Lane, is a tight scrum of around sixty small bars and restaurants linked by alleys just wide enough for two to pass. 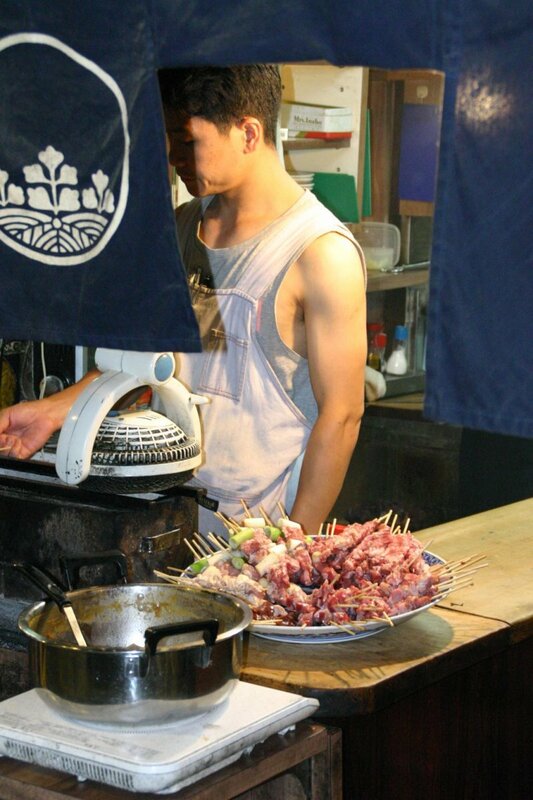 The air is thick with smoke, which billows out of open windows as yakitori is grilled. “Somehow it still feels the same,” Yoji says. 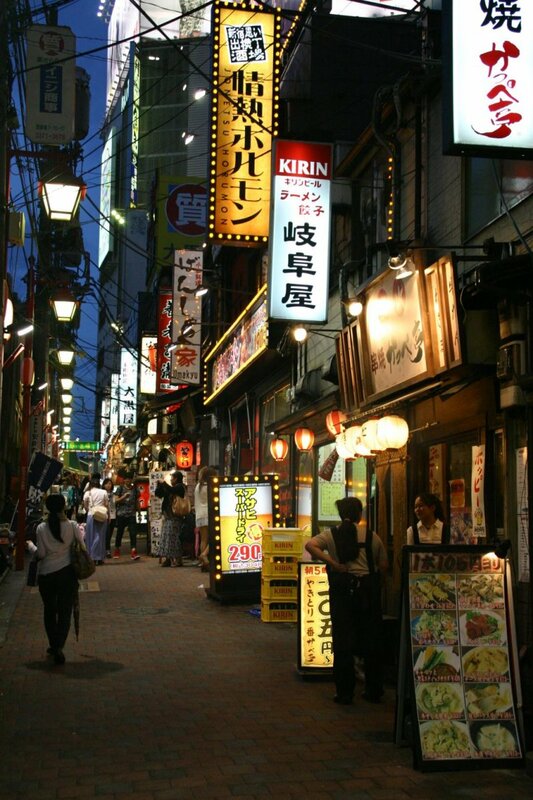 “Can we eat?” We can, and with the yakitori and mugi shochu ordered, Yoji settles back and begins to tell me stories about Shinjuku’s Showa past. 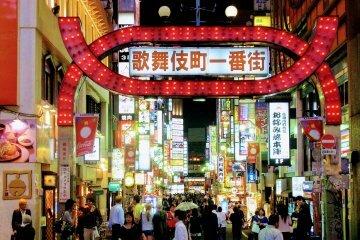 Although this is a modern name, Memory Lane has genuine roots dating back to 1940s post-war Tokyo, when it was the location for street vendors and black market traders. As the area developed into a drinking den, more permanent structures began to form, often separated by just a single wooden panel. These structures lasted until 1999, when a fire destroyed the area and the maze had to be rebuilt. Along with it came the new, more polite name of Memory Lane. 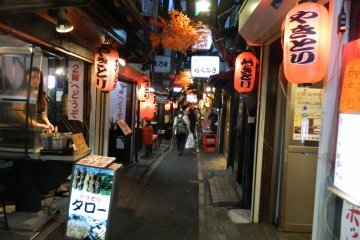 It’s easy to access Omoide Yokocho. 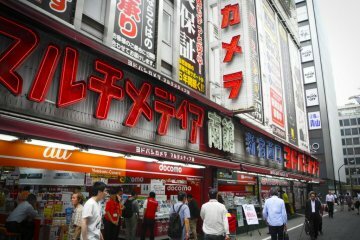 Step out of JR Shinjuku station’s east exit and walk along the left side, towards the big Studio Alta video screen. Before you reach the road you’ll see a pedestrian underpass on your left. 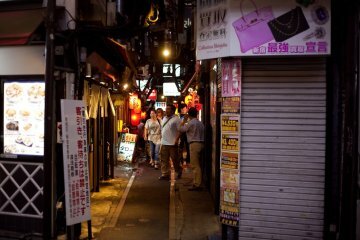 Follow this, and it will lead you right to the mouth of the den, identifiable by the green neon signs above the alleys. 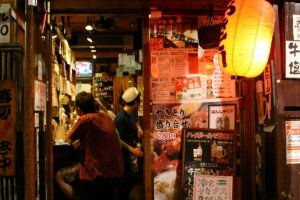 The website for Omoide Yokocho has a very useful map that lists each establishment by number. My first recommendation is to go at night. This may sound obvious, but visitors to Tokyo have different schedules and some may be looking for lunch. Be warned, not everything is open during the day and you won’t find the atmosphere that makes this an alternative, memorable night out. Second, don’t be a prude. The grit and grime, along with the smoke and noise, is all part of the charm. If you’re looking for dining elegance, save it for the next day; for now, kick back and relax, and act as if wartime rationing has only just ended. 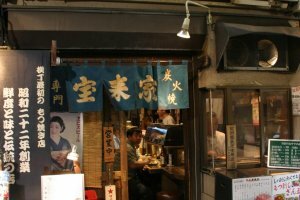 Sake, also called nihonshu, is Japan’s most famous drink, and Daikokuya (number 11 on the map) has over 150 different types from all over Japan. When I visited, a local diner who spoke English recommended a sweet sake. The mama-san (proprietor), who didn’t speak English, picked out something special for us anyway. 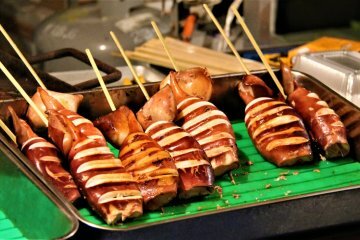 We dined on grilled fish, yakitori and tempura – which was something special, as it came with a melt-in-the-mouth fish called kiss. Up until the fire in 1999, there were no public toilets to serve the customers. These days, the establishments all have their own conveniences, but if you need the services of a public restroom then you’ll find one just off the middle alley (see the map). You may have to step over a man who’s slumped on the ground, but don’t worry, he’ll be sober enough in time to catch the last train home – see what I mean by atmosphere? Back in the 1940s, this area became known for its trade in animal organs, with liver and intestines being sold from open carts. Rest assured there are food hygiene laws in force today, but the adventurous might want to try Asadachi (number 20 on the map) for horse meat and farmed Chinese soft shell turtle. 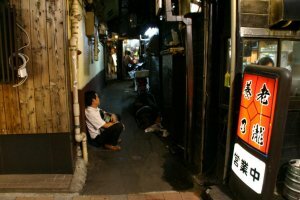 The best recommendation I could give would be to walk through all the alleys first in order to soak up the atmosphere. Take a look around and see what looks good. Many establishments have English menus, but don’t let this be the sole factor in your final decision. Most of all, just enjoy yourself. 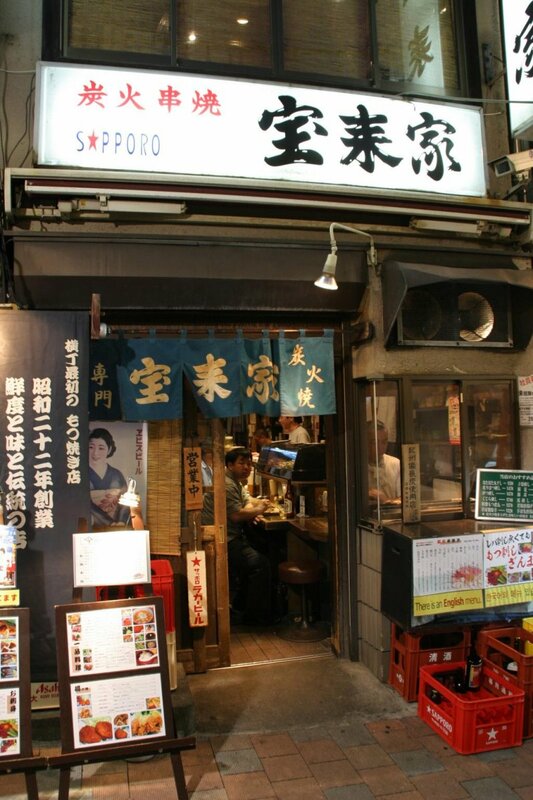 Omoide Yokocho may be a walk down memory lane, but as Yoji said of the 1950s, there’s also a hint that the best is yet to come. 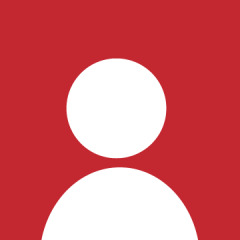 My business is communication. I'm lucky enough to do a job I love - teaching English at a leading Japanese university, and at global companies such as Olympus, Panasonic and Hitachi. I love motorcycles, and have written for a motorcycle magazine in England. I've also ridden my motorcycle across eight countries in Europe. I used to race, and have crashed at every circuit I've been to - but walked away to tell tall tales in bars across the world! I have a vague plan to head back to the Himalayas and ride up to Ladakh on an Enfield Bullet. I've been in Japan now for 12 years, which is quite funny since I only planned to come for one. Life's a journey, so saddle up and ride. 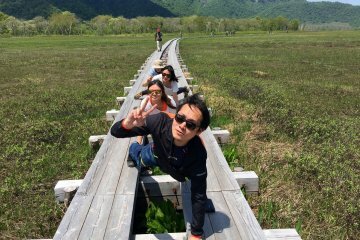 Oze National Park Hiking Tour.. The vibe of this place is incredible. Definitely recommend it. 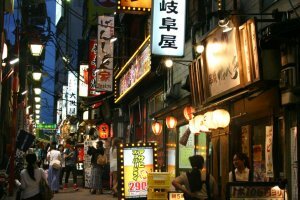 I have heard of Shinjuku in my previous research about Japan. It's a very popular district in Tokyo. I would like to visit this place when I travel to Japan. Looks like a very interesting and exciting place. Thanks for sharing the history of this popular place. Cheers! 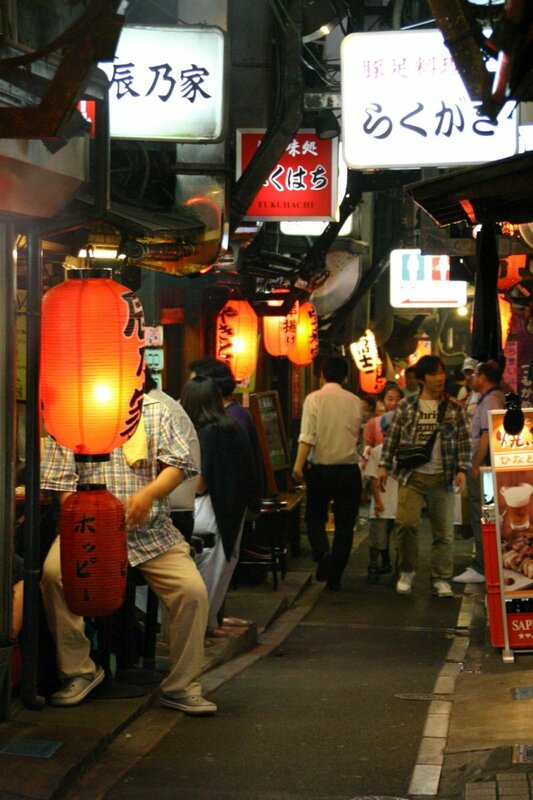 Shinjuku is crowded, but when we walking in the lane it`s quite peacefull. And the atmosphere during the night is the best one I think, like you said. Wow! I have walked past this place plenty of times but I had no idea of the history. 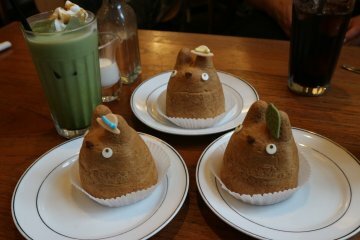 I will definitely be venturing down the street the next time I go to Shinjuku.